Pirates Online Retribution is officially PUBLIC once again! Welcome to the Pirates Online Retribution project! We are a group of highly dedicated developers, financiers, and designers hellbent on resurrecting the now defunct popular MMO, Pirates of the Caribbean Online. Together, we are restoring lost hope to a very special community. Retribution is at hand! Hosted on six Intel Dual Xeon E5-2630v3 servers to ensure optimized performance! Fully certified game developers, and design artists! 100% Free to Play, and always will be! Quality customer support from our admins and moderators! Top of the line DDOS and Hack protection firewalls to ensure 100% uptime! Battle against the undead legions of Jolly Roger. Create your own crew or guild. Plunder enemy vessels on the high seas, and seek to become the most notorious pirate in the Caribbean all over again! Are ye' finally ready to relive the legend? 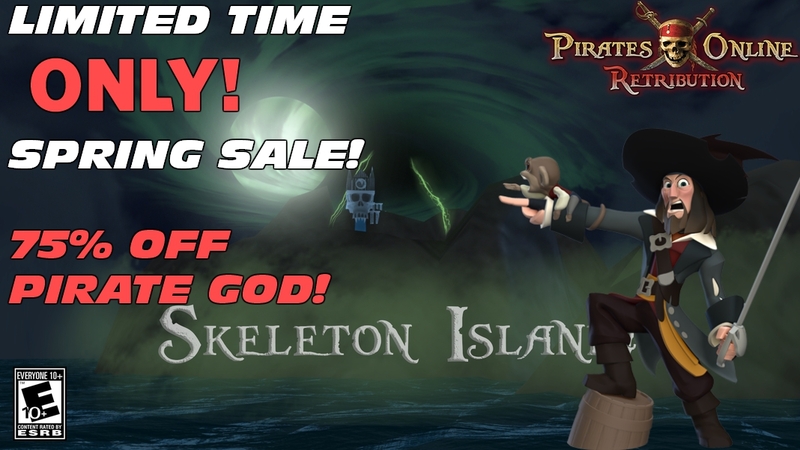 Pirate God Super Discount Sale! Pirate God will be 75% off from now until May 1st! In celebration of Pirates Online Retribution now being well over a year old, we've decided to reward our steadfast community with a 75% OFF Spring supersale on all Pirate God purchases from now all the way up until May 1st! The Pirate God rank is the most exclusive donor rank that we offer here at POR, and is also our only lifetime package, which means that you only have to pay once! No subscription necessary! As a Pirate God, you receive dozens of unique benefits, including the ability to play Pirates Online as a Game Master! Be sure to take advantage of this legendary opportunity before it's gone! Be sure to join us on our Forums over at https://piratesforums.com as well to connect with yer fellow Pirates and Swashbucklers here at POR! By using the site and the game you agree to our Terms of Service. © Pirates Online Retribution 2017.